Pinpointing stage wins as the big target for its first-ever participation in the biggest race in cycling, Orica-GreenEdge has unveiled a promising lineup for the Tour de France team. As expected, three of the team’s most successful riders make the squad, with Simon Gerrans, Michael Albasini and Matt Goss each aiming to stand on top of the podium during the three week event. Gerrans got things rolling for the team when he won the Australian road race championships in January and then went on to take the overall classification of the Santos Tour Down Under. 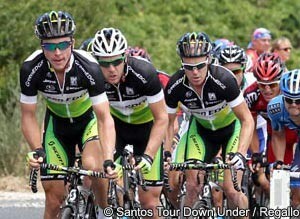 It was a perfect start to the first-ever Australian WorldTour squad and gave it instant exposure back home. The headlines were amplified when he scooped victory in Milan-Sanremo in March, beating Fabian Cancellara (RadioShack Nissan) and Vincenzo Nibali (Liquigas-Cannondale) to the line. He’s been a little quieter since then, but has structured things towads being sharp for the Tour. "He has had a very successful year to date," said directeur sportif Matt White. "An opportunist with a knack for winning from breaks, we'll look to Simon on a few key stages." Albasini has been truly impressive this season, stepping up to a new level with the team. He grabbed two stage wins plus the overall in the Volta a Catalunya, climbing better than he had done before, then showed that same uphill strength to win a stage of the Tour de Suisse. His placings also include second in Flèche Wallonne, and second yesterday in the Swiss road race championships. Last year he took a stage in the Vuelta a España and he is gunning to do the same in the Tour de France. Goss is one of the fastest sprinters in the world and while his victory list in 2012 is limited to a stage of the Giro d’Italia, he has structured everything about being right for the Tour de France. He noted this year that the Tour has a particular type of sprinting which suits him, with very fast leadouts working to his advantage and, after making his Tour debut last year, he returns this time round looking for at least one victory there. "While we have a lot of goals for him in the Tour, his main objective is clear," said White. "He is on the hunt for stage wins." Because the team is not targeting the general classification, it means that he will get more dedicated support than the sprinters on many other teams. Former Tour green jersey winner Baden Cooke is one of those who will lead him out, as will Brett Lancaster and Daryl Impey. After winning a stage of the Volta a Catalunya, the latter made his Grand Tour debut this season. The team withdrew him before the end, thinking perhaps of the Tour and after he showed form and good recovery to snag a stage in the recent Tour of Slovenia, has got the nod for the biggest race in cycling. White has been very impressed thus far. "Daryl has been the biggest revelation in our team this year," he said. "He came to us without a lot of experience in setting up a sprint but has clearly solidified his position as one of the world's best leadout riders in a very short period of time. He has made himself an obvious pick for our Tour de France team." Cooke has a huge amount of experience, of course, and should also be very effective in that role. White describes both him and Lancaster as being crucial parts in the sprint train. 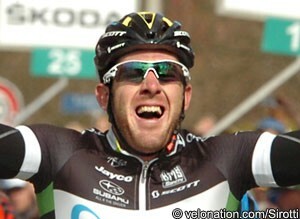 Another who will also be able to help out is another past stage winner in the Tour, Stuart O’Grady. He’ll be starting his sixteenth consecutive Tour and will have an overall guiding role for the squad. "He is without any doubt the most experienced rider on our team,” said White, describing him as the team’s road captain. “Not many riders have more Tour de France racing experience than Stuart. Along with acting as leader on the road, I wouldn't be surprised if Stuart looked at his own chances along the way." The team is completed by Classic specialist Sebastian Langeveld, who is back in shape after breaking his collarbone in the Tour of Flanders, and the Dutch climber Pieter Weening. He won a stage in his 2005 debut but hasn’t ridden the race since 2008; he’s back again this year, and could do something big in the mountains after netting tenth overall in the Tour of California and fifth and sixth on stage plus eleventh overall in the Critérium du Dauphiné. White said that the team had the welcome problem of having more than nine riders capable of making the team. It gave Orica GreenEdge a range of choices and the squad was finally calculated on the basis of how they would all interact together in helping to achieve the best set of results. Starting the Tour for the first time will be a nervous moment, not least because Australia has high expectations and awareness of the race after Cadel Evans won overall last year, but the quality of the team points to at least one stage win between Liège on Saturday and Paris three weeks later. And while the team is expected to unveil a new-look kit during the race, the riders will also aim to wear one of the Tour’s own jerseys during the three weeks. If it can take green to Paris, all the better.